WebVTT is a relatively new standard for captions and subtitles published by the World Wide Web Consortium (W3C). The acronym stands for “Web Video Text Tracks.” The standard was originally proposed and drafted by the Web Hypertext Application Technology Working Group (WHATWG), a collaborative community focused on the evolution of HTML and the development of APIs needed for Web applications. In 2010, the group began discussions about what should be the standard caption format for HTML5, and in particular, whether to adopt the XML-based TTML standard or develop an entirely new standard based on the SRT format. TTML had the advantage of being an existing, mature, and full featured standard, but had the disadvantage of being somewhat complex. On the other hand, a new SRT-based standard had the advantage of SRT’s broad popularity lightweight syntax. The group ultimately decided on the new standard, and initially named it WebSRT. It was later renamed to WebVTT and taken over by newly established working group within the W3C, the Web Media Text Tracks Community Group. In November of 2014, the new W3C group published the first working draft of WebVTT. WebVTT gained traction quickly within the web community, including support of basic features by all major browsers. Advanced Styling via External CSS—Individual cues or groups of cues can be styled using cascading style sheets (CSS). The CSS can be in a separate file, the companion HTML document, or embedded in the WebVTT file itself. Voice Tags—Tags can be used in cues to indicate who is speaking. Each speaker’s subtitles can have a unique style. Ruby characters—Ruby characters are small textual annotations (i.e. glosses) placed above or alongside logographic characters (e.g. Chinese script or Japanese Kanji) to show the pronunciation of characters that are likely to be unfamiliar to the reader. Regions—Areas of the screen (regions) can be defined, and each cue can be directed to any defined region. Positioning—The location on the screen may be specified on a cue-by-cue basis or via defined regions that are referenced by captions. Alignment and Direction—Text can be left, right, or center-aligned within the caption box, and the horizontal (left-right) and vertical (up-down) text direction can be specified as well. Rendering Style—Pop-on, Paint-on, and Roll-up captions are supported. Also, inline timers can be used for karaoke style captions. While special versions of SRT supported some of the above, the support was inconsistent and incomplete. WebVTT incorporates these features into the standard, so that any web browser or video player claiming 100% support for WebVTT can be relied upon to support these capabilities. The first line of a WebVTT file must start with “WEBVTT,” whereas an SRT file starts with the first caption group (aka cue). An optional header can be inserted after the first line. If the header is not inserted, then a blank line must be inserted before the first caption group. WebVTT uses periods as the fractional separator for timestamps, whereas SRT uses commas. The frame numbering/identification preceding the timecode is optional. Metadata frames identified by the word NOTE can be added. The only supported extended character format is UTF-8. The SRT <font> tag is no longer supported. Instead, individual cues and classes of cues are styled using CSS that is defined in a separate file, the companion HTML document, or embedded in the WebVTT file itself. In the above example, there is only a minimal header (e.g. “WEBVTT”), there are no style, region, or comment blocks, and the cue blocks are basic, with no advanced features such as formatting or positioning. The header and cue blocks are discussed in more detail below. The style, region, and comment blocks are covered under Advanced Features. The following example shows three cue blocks, each with a cue identifier (the sequential number at the beginning of each cue). Here's why I love science. Cue identifiers are a single line of text used to uniquely identify the cue. They could be as simple as sequential numbers beginning with 1 (e.g. as in an SRT file), or they could have text names, such as “Credits” or “Caption Copyright Notice.” Each identifier must be unique across all other cue identifiers in the file. They can be referenced from external style sheets in order to provide specific styling for individual cues. Don’t worry too much about what the settings in the above example mean. Positioning and alignment will be discussed in more detail under the Advanced Features section below. Cue payloads are the subtitle text that is to be displayed on the screen. They come immediately after the cue timing line, and can be one or more lines in length. Line separators will be preserved. That is, even if the combined text of two lines would fit on one line, the subtitle will still be presented on two lines as indicated in the file. However, if a line will not fit the width of the cue box (aka caption box), it will be wrapped, not truncated. 05/13/2016 06:13 PM - Revision 1.1 - Positioning completed. 05/14/2016 12:25 PM - Revision 1.2 - Review completed. Final draft. NOTE I’m not sure the timing is right on the following cue. — It will perforate your stomach. The above example shows both single-line comments and multi-line comment blocks. Comments are shown between the header and the first cue block, and also between cue blocks. Comments can also appear between style and region blocks. The basic functionality discussed so far is sufficient for presenting captions that are all styled consistently in the default player format. The following sections discuss advanced features that allow for styling (font, size, color, background, italics, bold, etc. ), alignment, positioning, text direction, rendering styles, animation, and more. - Johnny, where are you? I want to read to you. In the above example, “Over here” in the second cue is italicized to indicate the speaker is offscreen. “There” in the third cue is in bold to indicate emphasis, and Green Eggs and Ham in the last cue is underlined because it is a book title. Comment blocks can be used between style blocks. <v Speaker01>John, is that you? <v Speaker02>No, this is Larry. Notice that voice spans don’t have to be closed if they cover the entire cue text. In the last cue, two speakers each have their own voice span. In the example above, the み character is placed above the logographic character, 見, to indicate punctuation. This line will display vertically, in the rightmost position. This line will display vertically, to the left of the prior line. producing a ragged left edge. horizontally within the cue box. and aligned at the top edge. The position of the cue box is specified using two cue settings: position and line. These two settings have different meanings based on the text direction. If the text direction is horizontal (default), position specifies the horizontal location and line specifies the vertical location of the cue box. Conversely, if the text direction is vertical, position specifies the vertical location and line specifies the horizontal location of the cue box. In other words, position specifies the location along the axis of the text direction, and line specifies the location along the other axis. The position value is an integer percentage from 0% to 100% and specifies the distance from the left or right edge of the screen (for horizontal text direction) or the top or bottom of the screen (for vertical text direction). The text alignment also affects the meaning of position. If horizontal text is left-aligned, then position:0% means that the left edge of the cue box is at the left edge of the screen, and position:50% means that the left edge of the box is at the horizontal center of the screen. However, if horizontal text is right-aligned, then position:100% means that the right edge of the box is at the right edge of the screen, and position:50% means that the right edge of the box is at the horizontal center of the screen. The effect that text alignment has on position can be overridden by explicitly specifying which edge of the cue box is to be positioned. This is done by appending “,line-left” or “,line-right” to the value. For example, for horizontal text, position:100%,line-right specifies that the right edge of the box is at the right edge of the screen, regardless of alignment. For vertical text, position:100%,line-right specifies that the bottom edge of the box is at the bottom edge of the screen, regardless of alignment. position:0% align:start Left edge of cue box is at left edge of screen. Top edge of cue box is at top edge of screen. position:0% align:center Center of cue box is at left edge of screen. Left half of box is offscreen. Center of cue box is at top edge of screen. Top half of box is offscreen. position:0% align:end Right edge of cue box is at left edge of screen. Entire box is offscreen. Bottom edge of cue box is at top edge of screen. Entire box is offscreen. position:0%,line-left align:end Right edge of cue box is at right edge of screen. Top edge of cue box is at top edge of screen. position:50% align:start Left edge of cue box is at horizontal center of screen. Top edge of cue box is at vertical center of screen. position:50% align:center Center of cue box is at horizontal center of screen. Center of cue box is at vertical center of screen. position:50% align:end Right edge of cue box is at horizontal center of screen. Bottom edge of cue box is at vertical center of screen. position:100% align:start Left edge of cue box is at right edge of screen. Entire box is offscreen. Top edge of cue box is at bottom edge of screen. Entire box is offscreen. position:100%,line-right align:start Right edge of cue box is at right edge of screen. Bottom edge of cue box is at bottom edge of screen. position:100% align:center Center of cue box is at right edge of screen. Right half of box is offscreen. Center of cue box is at bottom edge of screen. Bottom half of box is offscreen. position:100% align:end Right edge of cue box is at right edge of screen. Bottom edge of cue box is at bottom edge of screen. The line cue setting is used for vertical positioning of the top of the cue box (if the text direction is horizontal) or horizontal positioning (if the text direction is vertical). The value can be expressed as an integer or a percentage. If an integer, it represents the number of lines from the left, top, or bottom edge of the screen, depending on text direction. Integer values can be positive or negative. For example, if the text direction is horizontal, line:2 means two lines down from the top of the screen, and line:-2 means two lines up from the bottom of the screen. If the text direction is vertical:rl, line:2 means two lines from the right edge of the screen, and line:-2 means two lines from the left edge of the screen. If the text direction is vertical:lr, line:2 means two lines from the left edge of the screen, and line:-2 means two lines from the right edge of the screen. Percentage values are from 0% to 100%, and they represent the distance from the top, left, or bottom edge (depending on text direction), as a percentage of the screen width or height. For example, if the text direction is horizontal, line:10% means 10% of the distance down from the top of the screen, and line:90% means 90% of the distance distance down from the top of the screen (i.e. 10% of the distance up from the bottom edge). If the text direction is vertical:rl, line:10% means 10% in from the right edge of the screen. If the text direction is vertical:lr, line:10% means 10% in from the left edge of the screen. The size cue setting specifies the width of the cue box (for horizontal text direction) or the height of the cue box (for vertical text direction). The value must be an integer percentage from 0% to 100%. For example, if the text direction is horizontal, size:80% means that the cue box takes up 80% of the width of the screen. If the text direction is horizontal, size:80% means that the cue box takes up 80% of the height of the screen. Easily change the layout, format, and rendering behavior for groups of captions without having to modify individual cues. Style the region’s background and border differently from the cues it contains. Provide more control over the dynamic geometry of the caption box as the font size changes. Specify foreground and background regions in cases where they overlap. Many of the above features help satisfy FCC requirements for Captioning of Internet Video Programming. The id setting assigns a unique name for the region. For example, id:rBottomCenter. This ID is referenced from cues to indicate which region they should be rendered into. The width setting defines the horizontal width of the region, as a percentage of the width of the screen. Currently, regions only support horizontal text direction, so there is no equivalent setting for vertical text. The value must be an integer percentage from 0% to 100%. For example, width:80% indicates that the width of the region is 80% of the width of the screen. The lines setting defines the height of the region in lines. It must be a positive integer. For example: lines:3 specifies that the region is three lines high. This setting is useful for limiting the number of lines of rollup captions that can be shown at one time. The regionanchor and viewportanchor settings are used together to define the position of the region on the screen. The regionanchor setting defines a point within the region that will be pinned to a location on the screen. The viewportanchor setting specifies the location on the screen where the regionanchor will be pinned to. The values of both settings are formatted as “x%,y%” where x and y are positive integers between 0 and 100. For regionanchor, the values indicate the percentage of region width in from the left edge of the region (x%) and percentage of region height down from the top edge of the region (y%). For example, regionanchor:0%,100% specifies that the anchor point for the region is its lower left corner. For viewportanchor, the values represent a location on the screen in terms of percentage of width from the left (x%) and percentage of height from the top (y%). For example, viewportanchor:10%,90% specifies a point close to the lower left corner of the screen (10% in from the left and 10% up from the bottom). The bottom edge of the region is 10% up from bottom edge of screen. The width of the region is 80% of the width of the screen. The region is 3 lines high. The region is horizontally centered on screen. Text scrolls up from the bottom (i.e. rollup captions). 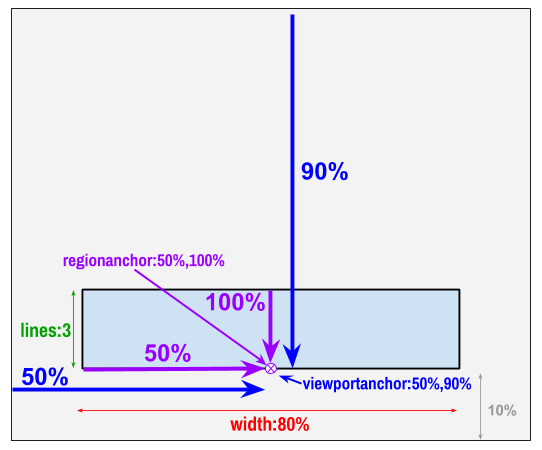 The following diagram illustrates how the width, lines, regionanchor, and viewportanchor attributes relate to the desired positions and geometry. The scroll setting defines how subtitle text is rendered within the region. Currently, there is only possible value: “up.” If scroll:up is specified, new cues will be inserted at the bottom of the region, pushing older cues up until they scroll off of the screen. See Rendering Style below for more details. Each region block is terminated by a blank line. With pop-on captions, the entire cue appears all at once (at the specified start time) and disappears all at once (at the specified end time). This is the default mode for rendering captions and is the most common rendering mode for web videos. In WebVTT, pop-on captions are the default rendering style. Roll-up captions are rendered one line at a time at the bottom of the caption box. Each new line pushes up the existing lines until they scroll off of the top of the box. This rendering style is typically used in live television broadcasts, which is where the term closed captioning originated. With live captioning, the bottom line is often progressively rendered, one word at a time. In WebVTT, roll-up captions are rendered one entire line at a time. This rendering style would be particularly useful for karaoke. Beyond karaoke, paint-on captions in general are helpful for conveying the cadence of music or speech to the hearing-impaired. The following video shows an example of what you would get if you ordered Speechpad’s Standard Captions. After you begin playing the video, click the “CC” on the video player to turn the captions on. The text box below the video shows you the WebVTT file for those same captions. WebVTT is just one of many formats you can download once the captions have been created. You could then use the WebVTT file to allow various players and video hosting services to present captions with your video (see compatibility list below). else. So they are using my money. dependent on how much money is involved. me a higher interest rate. WebVTT captions are available with either of Speechpad’s captioning services: Standard Captions or Premium Captions.